You know there are days like today when I feel I write only Sabyasachi posts. In the last three weeks, this is my third Sabyasachi story. The worst part, he’s doing a fashion show tonight which means there will be one more blog post before the end of this week. Sorry, if you’re getting harassed by the sheer amount of Sabyasachi content been fed to you. But what can your girl do? This man keeps on updating one collection after another. Yesterday was the launch of the brand new Sabyasachi 2019 Destination Wedding outfits. No one knew this was even coming up. Luckily Frugal2Fab Instagram had Sabyasachi on (turn on) notifications. I was halfway making a meal when the phone went ting-ting-ting. If you don’t follow the designer. Let me take this platform to enlighten you a little bit. This dude of a designer literally drops his entire collection within minutes on Instagram. Obviously, since I am in the wedding blogging business, I too have to drop everything and get on with my Frugal2Fab Sabyasachi work. That includes leaving a half cooked egg on the stove. They don’t call it sunny side up for no reason. Lack of time my friends! Anyhow, coming back to the collection. 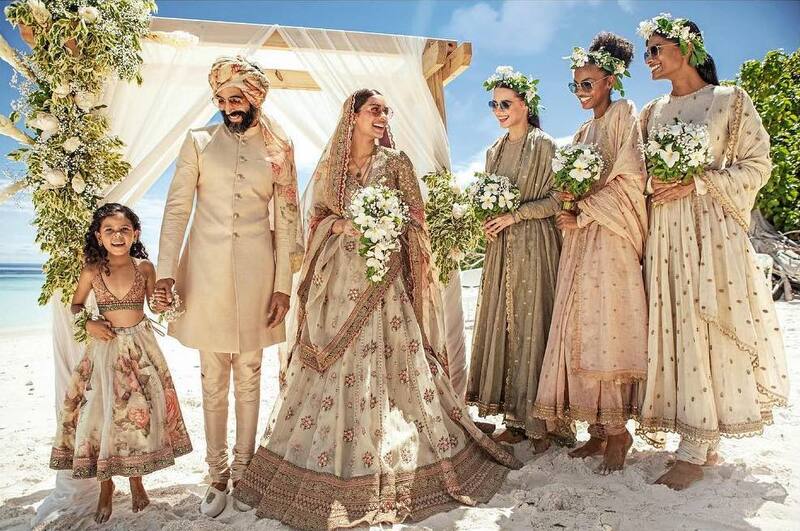 Sabyasachi launched his Destination Wedding/Resort edit for 2019 brides. It featured Miss World Manushi Chhillar in a gorgeous beach wedding lehenga. Sabyasachi has only shared a preview of his collection so far. In case you want to see it all, you’ll need to get a copy of the Conde Nast Traveller magazine for the month of April to May. But honestly, if you wait a little bit, the designer should put up the rest of the Sabyasachi 2019 Destination Wedding collection on his Instagram pretty soon. Isn’t she the cutest bridesmaid ever?!! My initial thoughts after seeing this was Sabyasachi is now doing kids wear too? The designer is known not to do customizations of any kind for brides. So seeing this definitely means there will be lots of kid wedding wear in his upcoming collection. So far, there are many good designers who do matching outfits with the bride, or mom and me wedding outfits. But a Sabyasachi kid wear lehenga, now that’s pretty new. Is it just me, or are you also thinking about the price? Take a wild guess and tell me in the comments how much you think this might be? Can you believe it? It’s been twenty long years. All this new back to back collections only means Sabyasachi is doing something big and celebratory of the twenty year in the business milestone. Today Sabyasachi is having a runway show in collaboration with Christian Louboutin in Mumbai. So I’m pretty sure tomorrow we will be loaded with more amazing Sabyasachi wedding and accessories. What do you think about the collection so far? Which one did you like better? This or the Namaste Easy Collection? Last night saw the elite most Bollywood celebrities walking in to attend the 20 years Sabyasachi fashion show. All of them wore the latest Sabyasachi 2019 outfits. From ruffle sarees to cocktail dress, lehengas and more. This post has all the pictures. The soul of Sabyasachi lies in craftsmanship- a value system that has remained unchanged since I started the brand 20 years ago. As you grow, it is very easy for values to be replaced by misplaced ambition. But I am proud to say that this value system has survived in our organisation. There were times when to cut costs and offer competitive pricing, one could have mechanised hand skills. But we do quite the opposite. Every bit of our merchandise uses more and more craft each year. Sometimes impossible detailing like hand-made buttonholes, desi meena in jewellery and cutting kundan, 24 colour screen lining are just some of the many things that go completely unnoticed by a majority of our consumers. But these processes create innumerable jobs year after year. From master weavers to dyers, printers to embroiderers, cutters to tailors, artists to carpenters, metal workers to sculptors, merchandisers to IT professionals, photographers to filmmakers, musicians to writers- the company supports over 27,000 people directly and indirectly. They are based out of West Bengal, Kashmir, Rajasthan, Gujarat, Maharashtra, Uttar Pradesh, Madhya Pradesh, Bihar, Assam, Odisha, Andhra Pradesh, Tamil Nadu and Kerala. Our ecosystem of people who have grown and survived with us is our proudest achievement and no amount of recognition or adulation can ever replace that. These are the people who create the world of Sabyasachi. Tirelessly. Without compromise. Every single day. The Kashgaar Bazaar collection of fine jewellery breaks the mould of traditional Indian jewellery by fusing cultural anecdotes from far and exotic places that have influenced Sabyasachi’s body of work. From Africa to Central Asia, through the North-West Frontier Province into the bylanes of Rajasthan and Varanasi, through hidden pockets of Kashmir, remote villages of Tibet and into the colourful bustle of the Far East, the collection is an eclectic mix of exuberance, old-world craftsmanship and a modern spirit of vintage whimsy. Unusual pairings of Zambian and Colombian emeralds, Burmese and Mozambique rubies with Iranian turquoise and Chinese jade, hand-picked moonstones, Catseye, Jasper, hessonite, sapphires, topaz, coral and pearls are sculpted with impeccable craftsmanship to create modern heirlooms. Tensions between the rustic and the sophisticated, traditional and the provocative have challenged boundaries to create neo-traditional jewellery that is as much statement as it is timeless.